The Daily Features offers a brief guide to the Paris Meeting, with science, education and program highlights combined with news updates. Check back every day! The Annual Meeting Program Committee has worked hard over the last 18 months to put together the most comprehensive set of educational courses, scientific sessions and platform presentations in the field of MR. Enjoy! 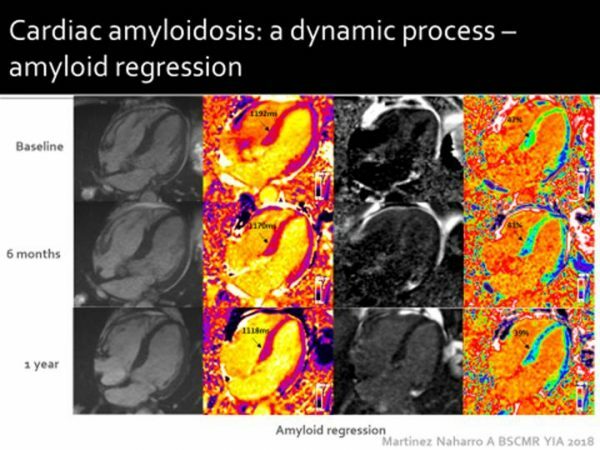 Saturdays’s SAM sessions: MR for Neuropsychiatric Disorders (afternoon), Body MRI: Realities & Controversies (morning), and Advanced Clinical MR Imaging in MSK (morning and afternoon). Check them out! Get prepared for the hottest topic of the year with the educational session on Deep Learning, Saturday @ 8am! And if you want more, an educational session on Statistical Analysis follows in the afternoon. Let the physics echo in you! 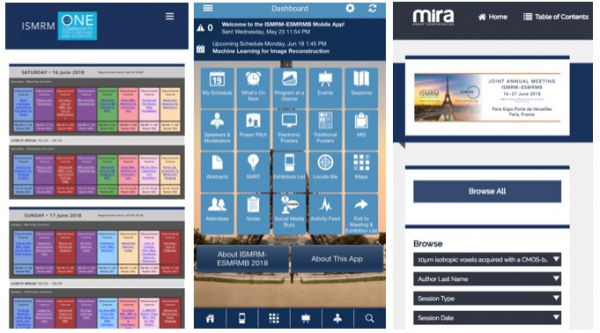 Use the mobile app for quick access, the searchable proceedings, and the program at a glance for a schedule view. Continuous discussions happen on Slack and Twitter. All information is on the main meeting page. SMRT Highlights - Award Winners! 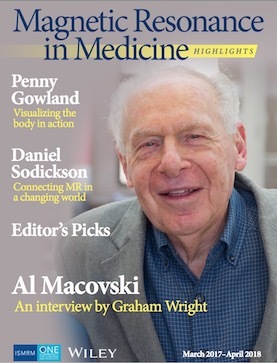 The SMRT John Kovelski Award for Professional Development was awarded to Hiroyuki Takashima, Ph.D.
MRM Highlights, now part of MR pulse, has produced a free hard-copy magazine sponsored by Wiley, available for pickup at registration! Have we created the meeting of your dreams? We want to know what you think! After each talk and/or session, feel free to tell us what you liked, didn’t like, etc. It is easy with the ISMRM mobile app! Note that all presentations from the Plenary Hall will be live-streamed free, and that all presentations are recorded for access by paid attendees. Visit the Program-at-a-Glance and click on the plenary sessions for more info. 5667 Abstracts will be presented: 871 oral, 329 power-pitch, 1804 traditional poster, 2577 e-poster, 69 educational/scientific and 17 educational e-posters. 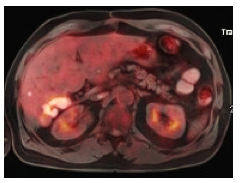 Video #1: Using a Dalmatian’s white coat metaphor, Gesine Knobloch explains the potential to use two contrasts agents to make visible small lesion in a human liver. Opening Sessions Today! Once you’ve had your fill of educational courses, come to the plenary hall for the opening ceremonies, gold medalists, and the Mansfield Lecture. Sunday’s SAM sessions: Is MR/PET better than MR + PET for the Brain? (afternoon), Prostate MRI, MRI in Pregnancy & Genitourinary (afternoon), Cardiovascular MRI: Vascular (morning), and Cardiac MR: From the Basics to New Horizons (afternoon). Check them out! Up for a debate as old as the ISMRM? The Lost in Translation: Neuroradiologists vs. Physicists session will be a thoughtful battle between radiologists asking physicists why they don’t design techniques that are clinically useful, and physicists asking radiologists why they don’t use their clever and excellent techniques. Early birds? Sunrise educational sessions start tomorrow, Monday at 7am! 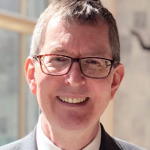 ISMRM President Dan Sodickson has led outstanding efforts forming the new Strategic Plan, highlighting our societies’ roles in a changing world. ESMRMB President Eric Achten offers updates on the European society. Dr. Petra Huppi will present “How Early Life Events Shape Our Brains: An MRI Perspective” at 5:30 pm in the Plenary Hall. 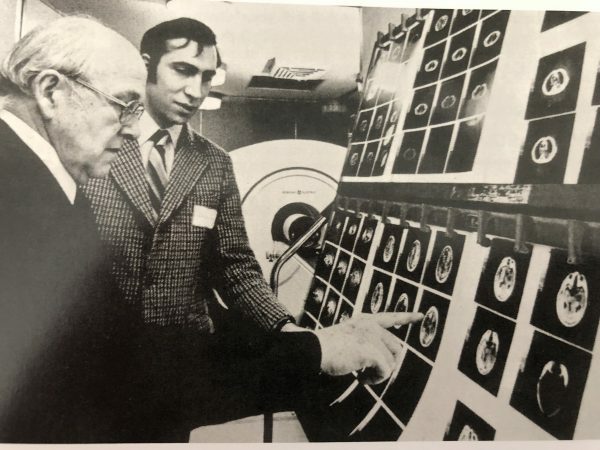 Sir Peter Mansfield’s seminal contributions have led to ongoing imaging acceleration that is allowing MRI to characterize the brain earlier and earlier in life. Dr. Huppi will discuss how MRI is helping our understanding of how events during key early periods in life affect our cognitive and emotional development. 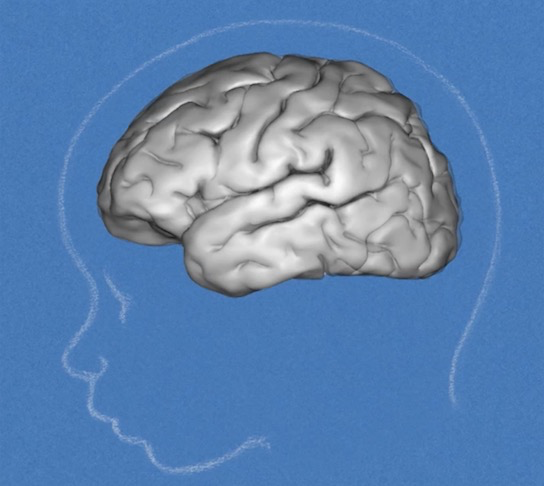 The understanding is leading to new ideas for treatment of neurodevelopment disorders. The Opening Reception from 6:30-8:00 pm is your first chance to visit the Exhibit Hall! As a global outreach to our MR community we offer “live streaming” for all sessions in Plenary Hall. 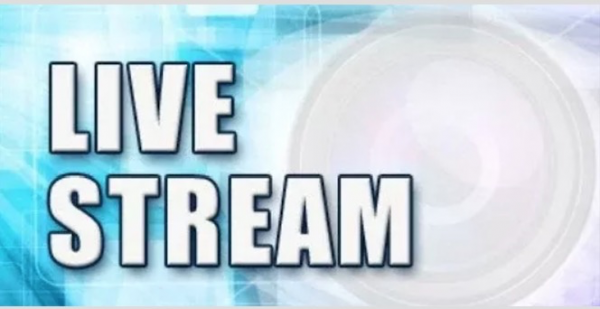 Go to Program-At-A-Glance and click the Live Streaming Available link to connect. 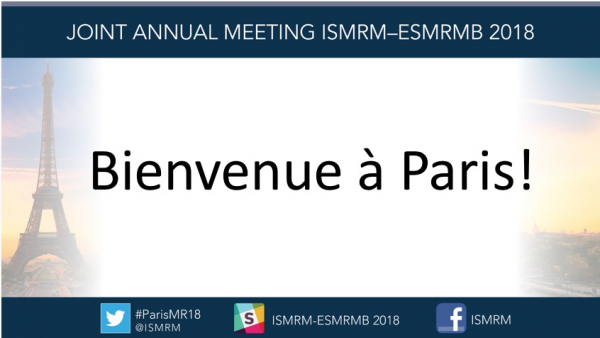 Click the home icon, or go to blog.ismrm.org for year-round communication about society meetings, workshops, research and more! 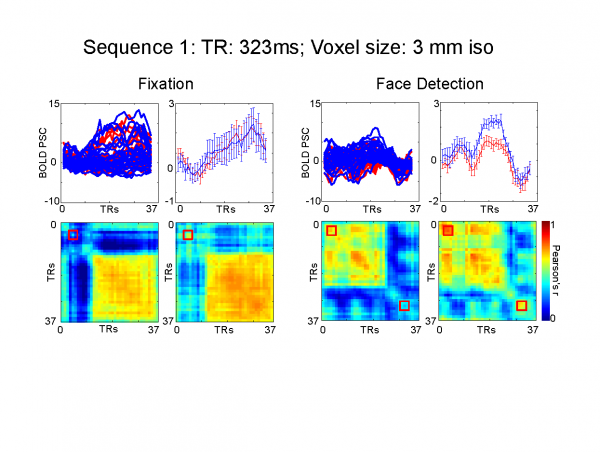 Video#3: Sophie Schauman explains the importance to speed up MRI acquisition time while having richer images and highlights her first step to make it happen using compressed sensing. Video #4: The MR community is in dire need of faster, more accurate and flexible image. Nadine Graedel unravel the potential use of a model forecasting the gradient’s behaviour in order to make it happen. We’re delighted to present the first slate of Member-Initiated Symposia - planned by you, the members. From extreme fields to exotic contrast, from cutting-edge neuroscience to the latest in clinical MR. These are sure to be some of the most exciting sessions all week. The Gold Medal is ISMRM’s highest honor, awarded for pioneering scientific contributions to magnetic resonance in medicine and biology. 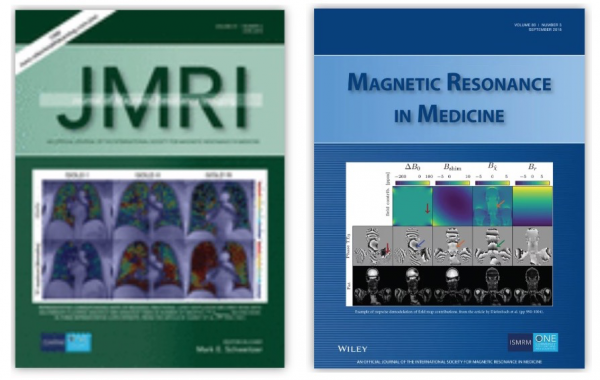 Junior Fellows receive mentoring from Senior Fellows, and observe an ISMRM committee. 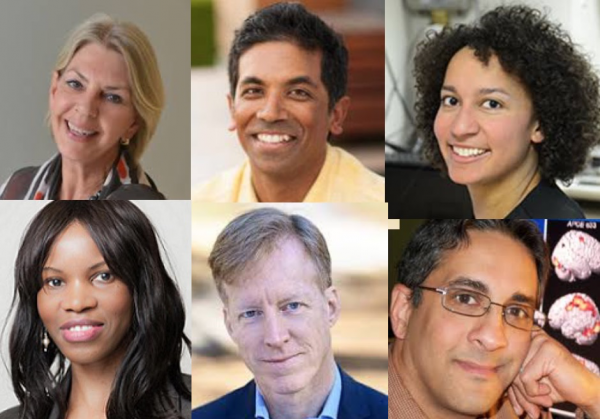 Senior Fellows are named for substantial contributions to the society and the field. We’ll hear from Dr. Kwong about characterizing the tissue of the human heart, from Dr. Uribe Arancibia on novel ways to measure cardiac function, and all about the clinical impact from Dr. Fontana. Proposed by the Molecular & Cellular Imaging study group, this session will examine the Safety & Efficacy of three Contrast Agents: 1) Gd-based contrast gents; 2) iron and other paramagnetic contrast agents; and 3) metal-free alternatives. 4:15-6:15pm in N01. 6 finalists for the W.S. Moore Award in Clinical Science and the I.I. Rabi Award in Basic Science will present oral sessions at 8:15-10:15am in S03, and E-posters at 1:45-3:45pm in the Exhibit Hall. This work suggests that serum biomarkers and cartilage T2 composition may reflect similar features of the pathophysiology of cartilage matrix degenerative disease. 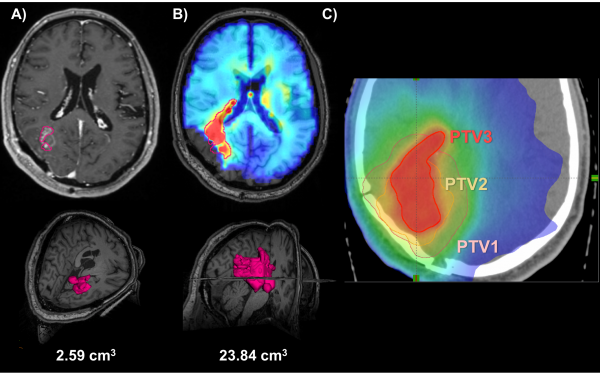 This work pioneers the application of hyperpolarized Carbon-13 in pediatric population and demonstrates the feasibility of using HP [1-13C]pyravate for assessing in vivo metabolism from pediatric patients with brain tumors. 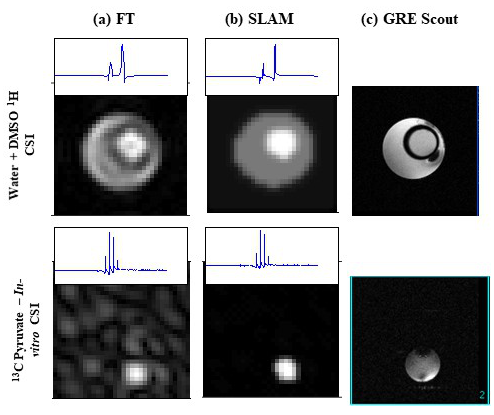 This work introduces an iterative approach to reconstruct the Carbon-13 imaging data, demonstrates its application on the in vivo data, and compares it to the traditional Fourier analyses. This work applies a new technique to probe the blood-brain-barrier permeability whithout using any exogenous contrast agents. This work synthesizes results of an extensive multicentric study (358 patients across 7 sites) and provides means to further understand the MS disease pathophysiology. 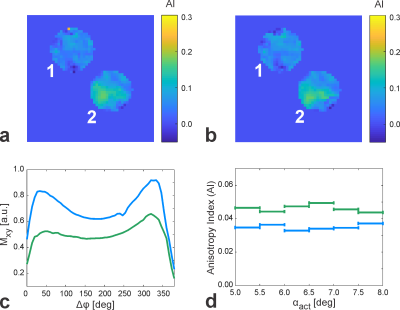 This work addresses the longstanding and highly debated question whether, and under which conditions, it is possible to measure human axon diameters in vivo. 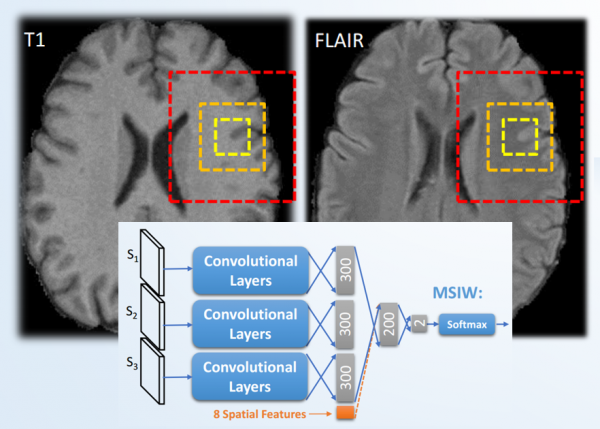 How Deep Learning can be used to solve an ill-posed deconvolution for more accurate quantification of the magnetic susceptibility distribution? 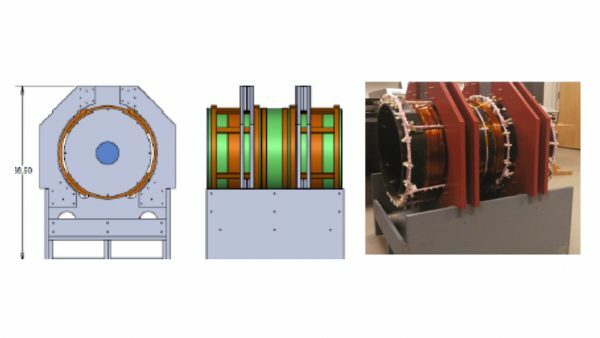 This work presents a validation workflow to account for model imperfections in local SAR estimation and allow accurate and safe SAR supervision for parallel transmission at UHF. Is ASL ready to replace Contrast-Agent perfusion methods in the clinic? Don’t miss the open debate and make your own opinion. Sunrise educational session, Monday @ 7am, Room N03. Don’t be afraid of spins! Educational sessions on MR Physics & Techniques for Clinicians will be running every evening session, Room S01. Basic principles of MR physics will be covered with non-mathematical presentations suitable for clinicians and physicists new to the field. What’s the value of MRI? Shall we image less or image more? What’s the value of MRI? Shall we image less or image more? Shall we move towards faster cost-effective protocols? Can we create new value and address unmet clinical needs? These questions are part of the MR value initiative previously launched by the ISMRM and continued this year. Don’t miss several Educational (M-07 & W-07) and Combined Educational & Scientific sessions (W-08) as well as Thursday morning Plenary. 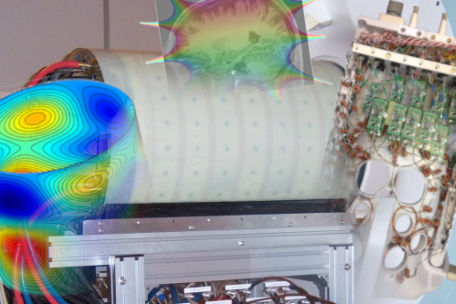 Video#5: The importance to measure brain oxygen using an MRI magnet by Caitlin O’ Brien. 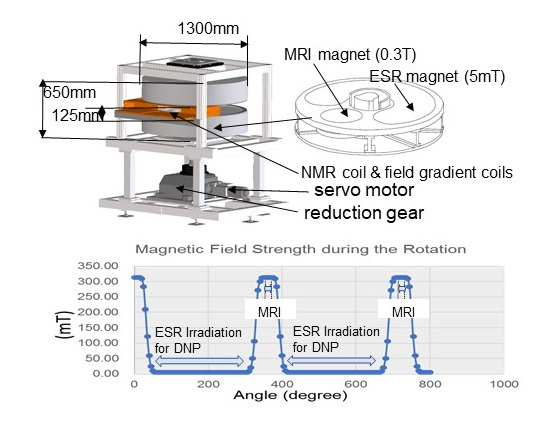 Video #6: A wireless coil as an alternative to standard cable-connected receive coils in clinical radiological settings by Alena Shchelokova. Dr. Miki Lustig will present “The Challenging Path Towards Pediatric MRI Without Anesthesia” at 10:45 in the Plenary Hall (watch the live stream here!). The hustle and bustle normally present in MR control rooms becomes especially focused and quiet whenever the pediatric anesthesia team is present to monitor children in MR scanners. Miki Lustig surveys specialty hardware, sequences and reconstructions to accelerate MR to ultimately avoid anesthesia. Current MRI technology enables acquisitions that violate some basic assumptions, with many implications. With Dr. Maxim Zaitsev, we ask if common MR dogmas are based on tradition or solid fact. Dr. Bram van Ginneken describes evolution of image interpretation by computers. Dr. Mariya Doneva points out insufficiencies of, and extensions of the Fourier model. 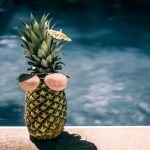 Finally, Dr. Kai Tobias Block considers solutions for technique integration and open development. Watch the live stream here! 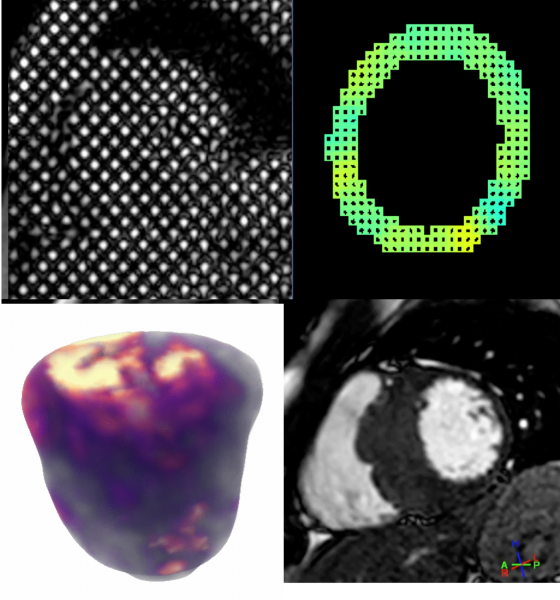 The proposed symposium will critically review the technical developments that have significantly improved the clinical usage of cardiac MRI during the last decade and will offer an overview of the cutting-edge research developments that could be game-changers in propelling the broad clinical adoption of cardiac MRI as the preferred imaging modality for multiple cardiac pathologies. Join us in congratulating this year’s ISMRM Research Exchange Grant Program awardees who each won US$5000 to foster collaboration within the ISMRM. Milou Straathof, Ph.D. – Excitation and inhibition; the Yin and Yang of functional brain connectivity? This work investigates how aging influences skeletal muscle diffusion tensor imaging (DTI) measures in a healthy cohort with a broad age range. Want to use DNP-MRI clinically? 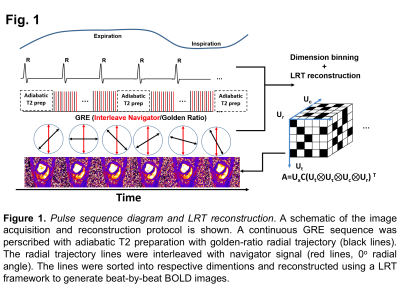 This work demonstrates a field-cycling system with the spatiotemporal resolution going beyond that of conventional MRI. Application of machine learning to CEST data acquired at 3T can reveal underlying spectral features observed on ultra-high field training data. This work raises many fundamental questions on the use of machine learning in MRI. 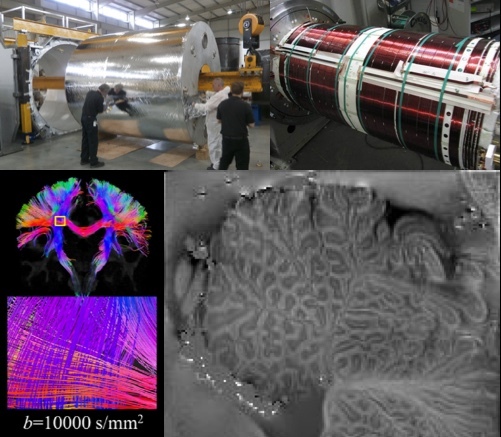 Tractography-based neurosurgical targeting, DTI outside the brain, and benefits and challenges of diffusion MRI at UHF will be covered throughout the rest of week. Don’t miss it every morning at 7am, Room N03. Want to buy a brand new Ultra-High Field MRI human scanner? The educational session Primer for UHF MRI is made for you! Practical information and guidance for brain and body imaging will be given by recognized experts of the field.Tuesday @ 13:45, Room N02. Drs. Bernstein and Schweitzer spoke to an enthusiastic and engaged group about becoming more active in the ISMRM by reviewing for our journals. Both editors are welcome to new reviewers. Today, I invite our society to look inward. We want to start a conversation about how unconscious bias affects our scientific society. There will be opportunities throughout the day to learn about the latest research on unconscious bias, to discuss how it is manifested in our field, and to think how we can move forward. Dr. Curt Rice will present “When the Right Thing to Do is Also the Smart Thing to Do: Research on Diversity in Research Organizations”. 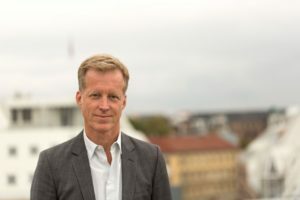 Dr. Rice is Rector ( President) of the Oslo and Akershus University of Applied Sciences. After growing up in the magnetic field of the Mayo MRI scanners in Rochester, Minnesota, USA, he is now playing a leadership position in developing and communicating evidence-based research on the implementation and derived benefits brought by inclusion and diversity. The ISMRM is pleased to provide a discussion from a leader advising institutions from universities to the Nobel Foundation. Plenary Session: Point-of-Care Diagnostics: MR’s Friend or Foe? We will revisit our current healthcare delivery system and technology development pipeline from the perspective of “Point-of-Care” (POC) diagnostics. Dr. Nimmi Ramanujam will highlight how cancer prevention platforms can be made more accessible and the toxicity of conventional cancer treatments reduced via POC approaches; Dr. Steven Schiff will describe how access to brain imaging can be dramatically increased in developing economies using low-field MRI; and Dr. Edwin van Beek will introduce novel ways for improving the efficiency and clinical value of MRI in our changing healthcare landscape. Science undeniably evolves through collaboration, transparency and inclusiveness. Please join in an inaugural community-wide action-driven symposium aimed at fostering ongoing dialogue on ways to mitigate bias and increase inclusiveness in ISMRM. MPI directly images the intrinsic magnetic moment of injected superparamagnetic iron oxide (SPIO) tracers, the same as used in MRI. This session describes strengths and limitations of MPI, ans synergies between MPI and MRI. 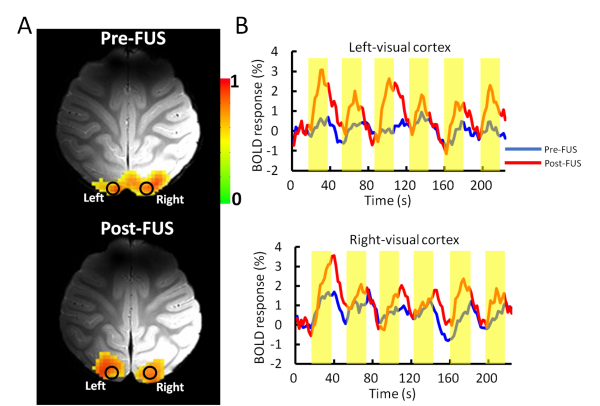 fMRI using high temporal resolution 7T fMRI data during attention modulations. 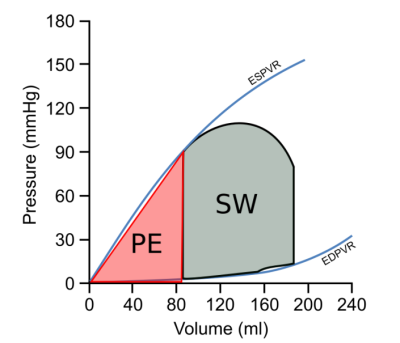 Fast measurement of myocardial oxygenationation during to acheive stress perfusion measurements without contrast. Ever seen a pumpkin being scanned? 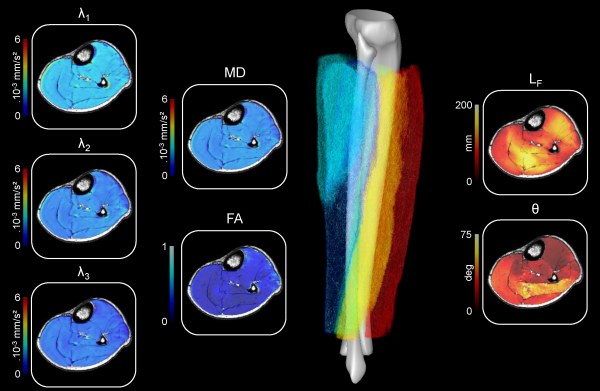 This work demonstrates a new multidimensional MRI experiment to probe microstructure of a pumpkin and of in vivo human brain. 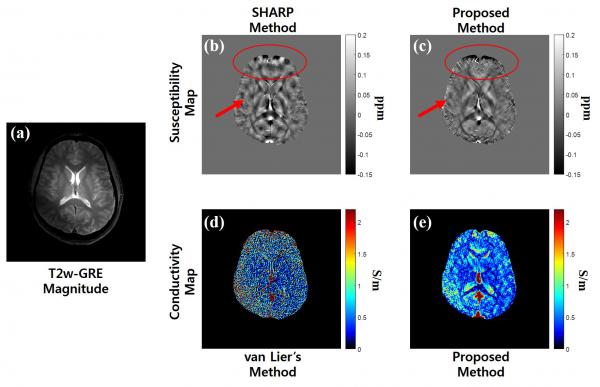 This work calculates susceptibility and conductivity maps by applying the Kalman filter to MRI phase images and compares the method to the SHARP filter and van Lier’s method, respectively. 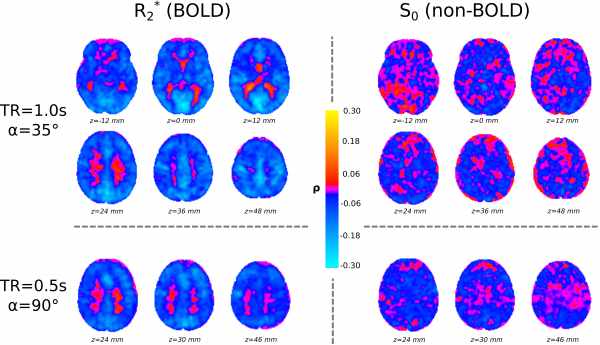 Blood pressure correlated fluctuations of BOLD origin in fMRI signals: A multi-echo 7T study. 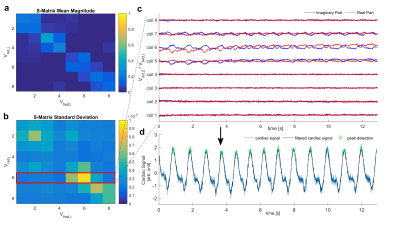 This work shows correlations of blood pressure with R2* signals, and compares with corresponding S0 signals. The results further suggest a significant proportion of BOLD dependent signal variance in fMRI that is of non-neuronal origin. Exploring the Origin of Asymmetries in the Balanced SSFP Profile at 9.4 Tesla: Microstructure Anisotropy or Chemical Exchange? Are you sure it is only Microstructure Anisotropy? This work explore the contribution of Chemical Exchange to anisotropies in bSSFP. 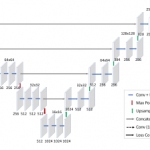 MR-STAT is a technique that can directly determine parameters from time-domain data. 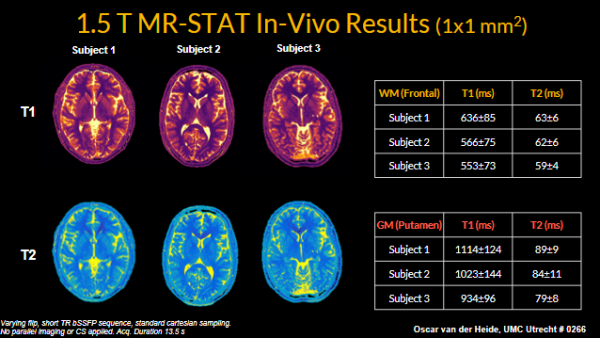 No Fourier transform is required solving aliasing constraints of existing Fourier based quantitative MRI methods. 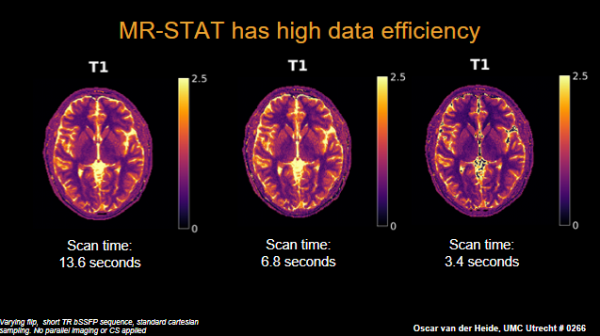 Oscar van der Heide from the University Medical Center Utrecht shows here the latest MR-STAT high resolution in-vivo results that are based on regular short cartesian readouts. Need an X-otic break? Non-proton imaging and spectroscopy can provide additional information that is not available with proton MRI and open new doors to assess body metabolism and physiology. Learn how at the Educational Session on Multinuclear Imaging & Spectroscopy: Methods & Applications. Wednesday @ 8:15am, Room S03. Let's get into human learning! Let’s get into human learning! 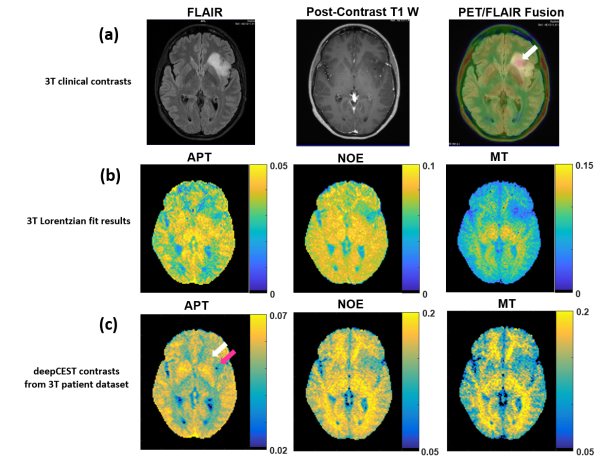 Don’t miss the Combined Educational & Scientific session on Machine Learning for Magnetic Resonance in Medicine Wednesday @ 13:45, Room N01. The session will address topics including regression and classification, model selection as well as performance evaluation procedures. Video #9: Jingjing Xu’s research tackles the crucial role of human hippocampus into the memory circuitry. Video #10: Brain images are complex and composed of many parts, like symphonies. Agah Karakuzu and Tanguy Duval help doctors and scientists tease out the instruments in the symphony and figure out if your brain is in tune. Had your fill of scientific talks? Check out the Magnetic Moments competition final this afternoon in the Resonarium. And after the Lauterbur lecture, grab your inner child by the hand and hop on the bus for the closing party. It will be magical! This is the final day of the meeting! Enjoy your remaining time in Paris! As we face exorbitant health care costs and ever decreasing research funding we will look at the positive impact of advancements in MRI on basic science and clinical care. Dr. Trattnig will focus on how high field strength (7 T) will improve the healthcare system, while Dr. Jezzard will address how MR contributes to fundamental science. Finally, Dr. Tempany-Afdhal will present a case study to examine how MR-guided intervention has reshaped prostate cancer diagnosis and treatment. Who won the Young Investigator Awards this year? The I. I. Rabi and W. S. Moore awards will be presented prior to the Lauterbur Lecture. 17:45 in the Plenary Hall. Five short presentations of specially-selected abstracts from the scientific program. Dr. Gary Glover will present “MRI in Yon Times of Yore” at 6:00 pm in the Plenary Hall. Paul Lauterbur’s seminal contributions inspired numerous new means of encoding MR signals. But back in the early days of MRI, compressed sensing and deep learning algorithms weren’t available to solve problems. Dr. Glover will be presenting the intuitive approaches that he and others used to circumvent imaging pitfalls from eddy currents, respiration, blood flow, “ditzels”, and the limited hardware of the day. 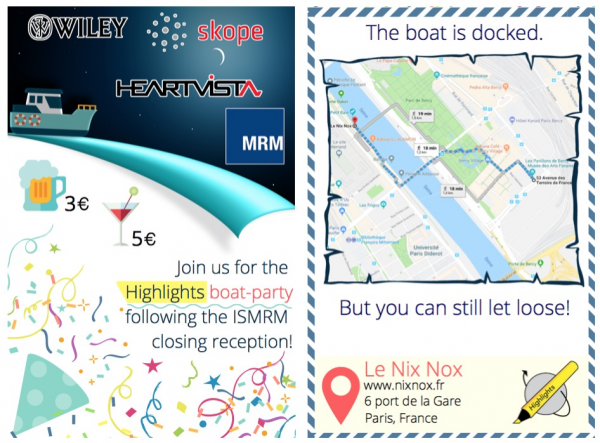 Enjoy a timeless getaway during the #ParisMR18 closing party. The event will take place in the beautiful Pavillons de Bercy-Musée des arts forains at 19:30. Buses to the closing party can be found at the entrance to Pavillon 7 immediately following the final plenary presentation at 18:45. MRI has great value in radiotherapy, because of the direct influence it has on improved patient outcome. Six prominent researchers and clinicians will share their latest insights and technological developments. Traditional posters must be taken down between 16:30 and 18:00 or they’ll be discarded. Don’t say we didn’t warn you! Experience the unique atmosphere of the Paris Fête de la Musique on the docks of the Seine during the Highlights after-party. We have reserved the interior of the boat NixNox, please have your badge to enter and get discounted drinks. The boat terraces are open to us and the public, details in the accompanying image. 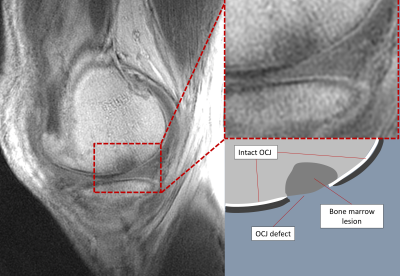 Can AI predict the presence and identify the grading of a meniscal lesion? This work provides a proof-of-concept by applying a fully-automated deep learning pipeline to knee MRI data. 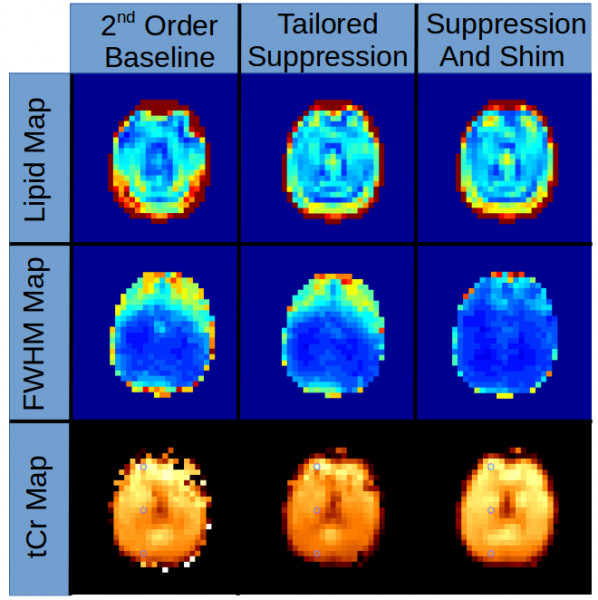 This work shows how in vivo brain Creatinin maps can benifit from taylored shimming and fat suppression. 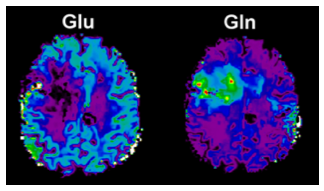 sMRI enables in vivo whole-brain analyses of methabolic activity. 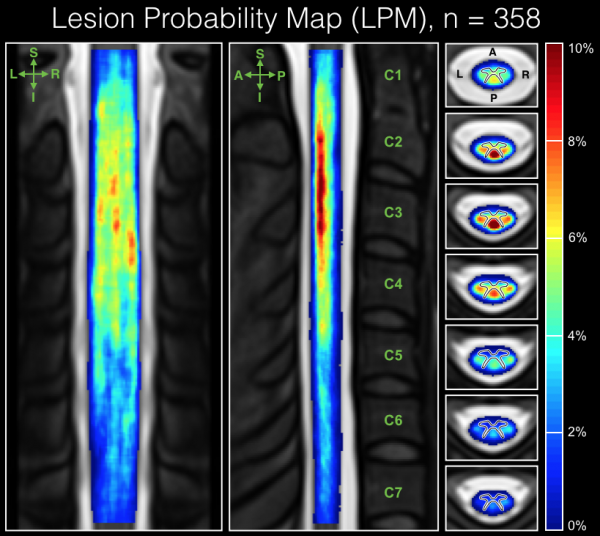 This work introduces an ongoing prospective clinical study to target metabolically active tumor identified by sMRI for a radiation boost, with the aim of improving outcome in patients with Glioblastoma. GABA and glutamate 1H-MRS provide insight into the excitatory and inhibitory mechanisms underlying learning and decision-making. Significant difference in μFA measurements is reported for DDE measurements performed at different TEs. An approach to 3D imaging of the fetal heart. Relax! And feel free to move. Come to the Combined Educational & Scientific Session to discover the most current hardware and software solutions for handling motion in MRI. Thursday @ 8am, Room S01. Are you fed up with artifacts? Come participate in the MRI Artifact Game Show! Learn about common MR artifacts and how to avoid them in a light-hearted game show setting. Educational Sesion on Thursday @ 15:30, Room S02. Come cheer for your fellow scientists in the inaugural Magnetic Moments live competition! Featuring a panel of “celebrity” judges from the public, this session will crown the 2018 Public Engagement Champion, with additional prizes for the Outreach Guru, People’s Choice, and Master of Simplicity. – Thursday @15:15PM in the Resonarium! 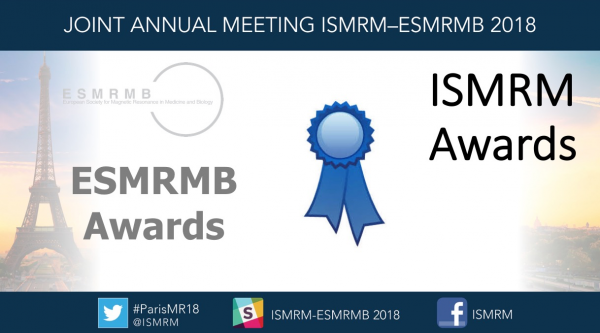 The Paris ISMRM-ESMRMB Daily Features is brought to you by the ISMRM WEB committee, and numerous contributors including Agâh Karakuzu (Layout Design), Wally Block, Olivier Girard, Jessica McKay, Atef Badji, Elena Kleban, Pinar Ozbay, Adrienne Campbell-Washburn, Sally Moran, John Celio, and Brian Hargreaves.